HOLA's very own Special Projects Director, Manuel Herrera, shown at right, was featured in the SAG-AFTRA New York e-newsletter, as a result of a Spanish-language voiceover workshop he conducted in November in conjunction with the SAG Foundation and the SAG-AFTRA National Spanish Language Media Committee. 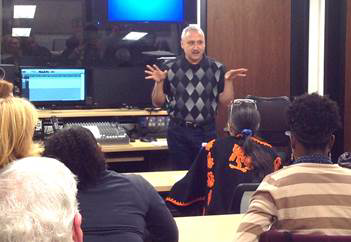 Herrera teaches a voiceover workshop with HOLA twice a year, with the most recent session having just concluded. The text from the e-newsletter is below. The SAG Foundation and the SAG-AFTRA National Spanish Language Media Committee hosted a series of Spanish-language voiceover workshops in the New York EIF Voiceover Lab with renowned actor, producer/director and voiceover consultant Manuel Herrera. More than 30 SAG-AFTRA members attended the workshops, which focused on helping Spanish-speaking actors fine-tune skills such as diction and voicing, rhythm and narration, interpretation and professional audition technique. Reactions were overwhelmingly positive, with members expressing gratitude for a workshop expressly tailored to the Spanish-language market and praising Herrera's skill as a teacher and guide.